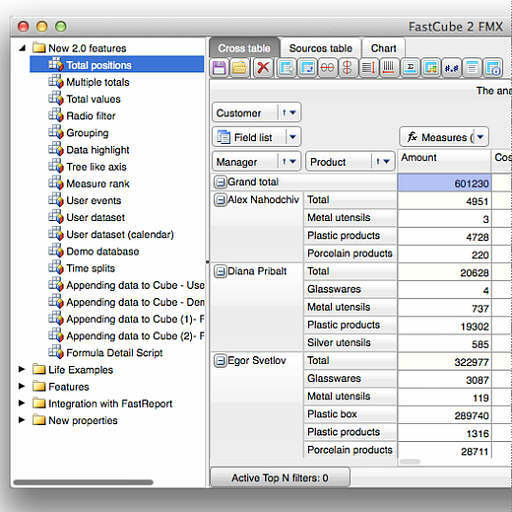 Fast Reports, Inc. has a component suite called FastCube FMX which is a set of OLAP components for Delphi XE6 Firemonkey on Windows and OSX. OLAP stands for online analytical processing. With OLAP you can perform multidimensional analysis of business data and have the capability to do complex calculations, trend analysis, and sophisticated data modeling. The FastCube suite allows you to analyze data, build summary tables, and create reports and graphs easily and instantly. It supports statistical operations such as count, sum, minimum, maximum, average, variance, etc. and special functions such as number of unique values, first value, list of unique values. You can filter for measured values, create data slices instantly, and export slices to Excel, Word, and HTML. The graphing is handled by TeeChart for Firemonkey. You can use standard ADO or BDE components and you can also use anything based on TDataSet. There are lots of other features as well. This is a commercial component suite but there is a demo available for you to try out first. Head over and check out the full feature list of FastCube FMX OLAP component suite for Delphi Firemonkey before downloading the demo. I’m not sure if this is intentional or not, but your posts often, if not always, seem to indicate the components you describe are only available for Delphi. I checked and this one is also available for FMX/C++ Builder users. I only use Delphi so that is mainly why. Considering FMXExpress has a “Firemonkey + mobile” theme I should probably mention C++Builder more. I believe most Delphi components (all?) can be used with C++Builder anyway however.